Federal law enforcement agents arrested 25 members of the hyperviolent transnational criminal gang known as MS-13 in California for their alleged involvement in murder, kidnapping, assault, and drug trafficking cases. 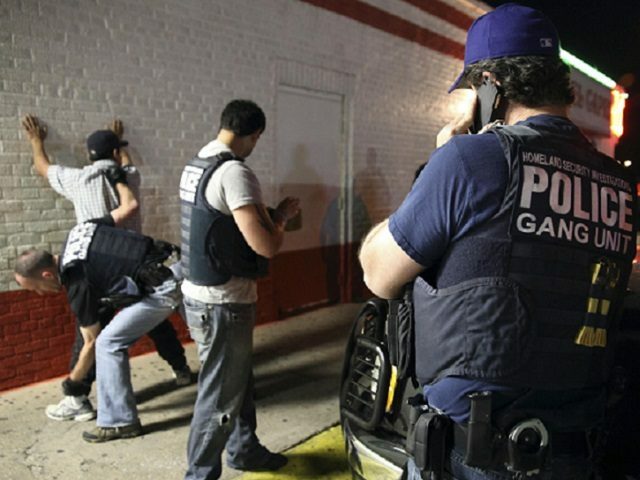 Agents assigned to the FBI and U.S. Immigration and Customs Enforcement’s (ICE) Homeland Security Investigations (HSI) carried out a series of arrests last week that landed 25 MS-13 members in the sanctuary state of California. On Friday, the U.S. Attorney’s Office for the Eastern District of California announced the unsealing of two federal indictments that led to the arrests. Charges against the MS-13 members include kidnapping and murder in aid of racketeering in one of the indictments. The second indictment included charges related to conspiracy and assault with dangerous weapons in aid of racketeering. Prosecutors said that law enforcement found evidence of broad criminal activity by the gang members in the California Central Valley near Mendota (located 35 miles north of Fresno). The alleged crimes include murder, assault, firearms possession, and drug trafficking. One of the indictments alleges that Israel Rivas Gomez and John Doe (aka Marcos Castro) kidnapped and murdered a man in Fresno County, California, on December 18, 2017. The alleged murder is reported to be in furtherance of the MS-13 gang’s criminal enterprise in the Central Valley. In May 2017, Luis Reynaldo Reyes Castillo and Nilson Israel Reyes Mendoza committed an assault with dangerous weapons for the purpose of gaining status within the gang and to maintain the gang’s presence in the community, officials stated. The complaint charges 16 individuals affiliated with MS-13 in Fresno County with various crimes, including two separate, gang-related assaults and drug trafficking activity to support the gang’s activity. Those documents allege that on August 12, 2018, Lorenzo Amador, along with two others, stabbed a rival gang member in the back at an intersection in Mendota. The victim was transported to the hospital, underwent surgery, and survived. Court documents also allege that on May 14, 2018, Denis Barrera-Palma, Ever Membreno, and Edgar Torres-Amador participated in a gang-related assault of a man walking near an elementary school, in which one gang member beat the victim with a metal pipe. Additionally, the complaint alleges that between May 2017 and August 2018, 16 members of the MS-13 enterprise participated in a drug trafficking conspiracy in both Fresno County and Los Angeles. These defendants allegedly obtained, sold, and profited from street‑level drug dealing, and used the proceeds to further MS-13’s criminal objectives. In addition to the Central Valley crimes alleged in the indictments, prosecutors said that parts of the operation included Los Angeles County. Officials seized guns, knives, and machetes during search warrants executed in four counties and in California prisons. The prison seizures included 37 cell phones, drugs, and weapons that were found in 11 prisons. The operation was a joint effort between federal, state, and local law enforcement officials including the FBI, ICE HSI, the Fresno County District Attorney’s Office, the Fresno County Sheriff’s Office, the California Department of Corrections and Rehabilitation Special Services, and the California Highway Patrol’s Special Operations Unit.